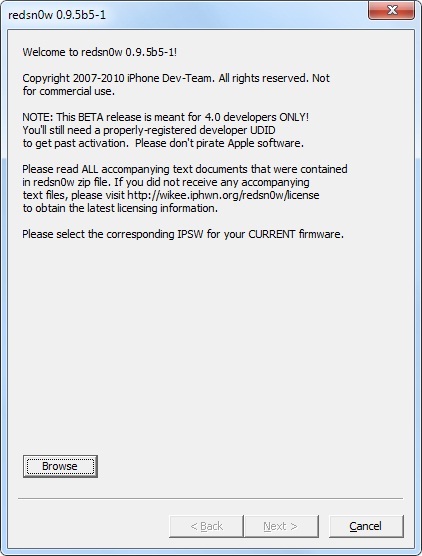 Finally the first iOS 4.0 jailbreak tool Redsn0w 0.9.5 Beta 5 for Windows is available now. All iPhone 3G & iPod Touch 2G owners can jailbreak iOS 4.0 on Windows if they are on official carrier and doesn’t require unlock. 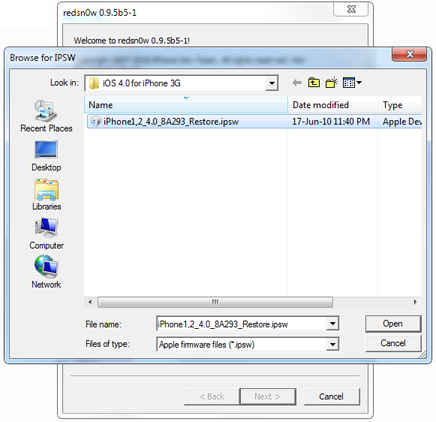 Redsn0w 0.9.5 also lets you to activate multitasking & background wallpaper of iOS 4.0 on iPhone 3G & iPod Touch 2G which has been blocked by Apple. So we are here with complete step by step guide to jailbreak iOS 4.0 on iPhone 3G & iPod Touch 2G with Redsn0w 0.9.5 Beta 5 on Windows. The guide will only work if you have iPhone 3G with old bootrom. Note: This release will not help you to hacktivate or unlock your phone. You need to registered iPhone UDID with Apple to get past the activation process. Therefore, DO NOT update to iPhone OS 4 Beta if you rely on an unlock, as upgrading will upgrade your baseband which will leave you locked. Download iTunes 9.2 (required to activate iPhone 3G). Download iOS 4.0 GM for iPhone 3G. Download iOS 4.0 GM for iPod Touch 2G. Download Redsn0w 0.9.5 Beta 5 for Windows. 3. Click on Next and Redsn0w 0.9.5 Beta 5 prepare data for jailbreak. 6. At this stage you will need to put your iPhone in DFU mode, to do this hold “Power” button and then while holding the “Power” button, you will now have to hold “Home” button too for about 10 seconds. 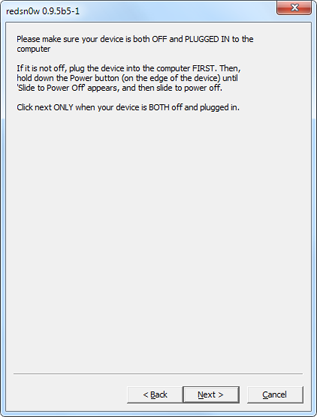 Now after few seconds release “Power” button but keep holding “Home” button until installation begins (about 30 seconds). 7 Now just wait until redsn0w completes the rest of the process. Once done, your iPhone 3G will restart automatically and you will find it jailbroken with iPhone firmware version 4.0. Please Note: There are no unlock tool available which can unlock iOS 4.0 with baseband 05.13.04, you must wait for official announcement form iPhone Dev team if you are planning to unlock. it wont work cuz mine is an MC model when will this be fixed? Went to safemode after u download something from cydia and respring or reboot and u cant get out of it!! went back to 3.1.3, do not try it! @liljake119 thanks for the safe mode tip. i uninstalled the program i last downloaded from cydia and it got rid of my safe mode problem. thanks! i wish they would make this work for mc models already… BUT ATTENTION PPLZ THEY ARE GOING TO MAKE IT WORK WITH MC IN FINAL VERSION OF REDSN0W! plz could someone help. On mine it just says unable to recognize specified IPSW. Can anyone help? i have an iphone 3g. i have downloaded the os4 firmware twice and i have the same problem. 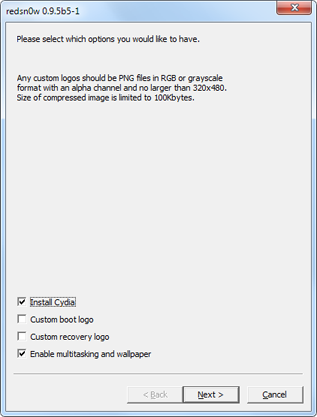 does installous work with 4.0? GKING BACK TO 3.1.3!!! EPIC FAIL SO FOR IPODTOUCH 2g!